Like I said yesterday was my birthday and it was a beautiful day. Plenty of sunshine, warm weather and you can feel the spring coming in full (today is colder though). Many phone calls, some visits and a very entertaining time spent with my wife, my parents and some friends. The day flew fast and I really enjoyed my birthday. As you can see plenty of books as preasants, I posted their pictures here although some of them are in romanian, and soon I have to look for a bigger library because the shelfs of the present one are pretty full :). 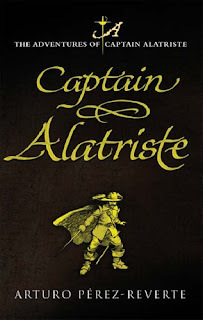 I will catch up with you in the next days, with my Pile o' Shame as I saw this one last week on A Dribble of Ink and with the review of "Elantris" as this book is almost finished. 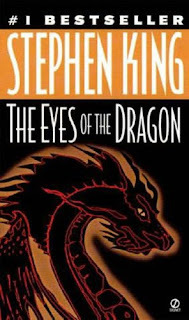 Tomorrow is my birthday and to celebrate that I will give myself a gift posting an older review of mine, but a review of one of my most favourite books. The world of literature would be far more poorer without George R.R. Martin. 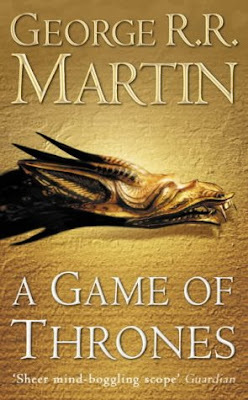 The author who was nominated and won the Hugo, Nebula, Bram Stoker and World Fantasy awards creates a novel "A Game of Thrones", the first volume in "A Song of Ice and Fire", that made me say only one thing: WOW. "A Game of Thrones" describes a fantasy world, named the Seven Kingdoms, that resembles medieval Europe and the events that unfold in the novel are very much the same with those from that part of history. The novel has three storylines, not one like many others. In the first storyline, Robert Baratheon, the king of Westeros after he claimed the crown in battle, visits his old friend, Eddard Stark in Winterfell. Robert asks his friend to become The King's Hand, second in charge of the kingdom, after the mysterious death of the former Hand. So the Stark family, one of the most powerful in the land, is split up. After the return of the king in the capital city, named King's Landing, starts a teribile fight for the throne that involves the Starks and the Lannisters, the queen beeing a decender of the Lannisters. The second storyline follows the events that occur at the northern border of the land, here lies the Wall, a construction that protects the country from the invasion of the mysterious creatures known as The Others. The story is centered on Jon Snow, bastars son of Eddard Stark, who is recruited in the Night's Watch, the men who maintain and guard the Wall. The third storyline is set on a continent east of Westeros where we find the Free Cities. Here had refuged Daenerys and Viserys Targaryen, the last known relatives of the previous king and they seek an army to help them retake the country and revenge the death of the king. The author mixes brilliantly the three storylines so I was never in difficulty when I followed them. The intrigue is complex, surprising, following political conflicts, the struggle for power, betrayals and love stories, and the twists of the situations do the reading more pleasant. And even though the novel has many characters this fact doesn't prevent me in savoring the read, because George R.R. Martin describes them very well, so well that you get attached to the characters. But here I have to warn you, because the author keeps the realism of life in his novel, the characters that we love can die as fast as those we don't find very attractive. I was thrilled about the fact that the author tells the story through different characters, so we benefit of different points of view about the same events, and this contributes to the atmosphere of the novel. And even though George R.R. Martin doesn't create an entirely new world, in the true sense of fantasy, he comes with many new and original elements like The Others or the cycle of seasons, for example the winter can last a lifetime. At the end of my reading the author left me wishing more,with joy and sadness, and also with questions about the next books in the serie. And if those are equal to "A Game of Thrones" I will be very happy. The novel has some weak points, but this are very few and honestly I don't want to recall them, so I will give the novel 10 points out of 10. This morning was more relaxed than usual and I've got the time for a little surfing. So let's see what news kept my eye. The biggest news that draw my attention was that of a collaboration between Stephen King and his son, Joe Hill. Gauntlet Press will release an anthology named "He is Legend: Celebrating Richard Matheson" and the anthology will contain a novella, "Throttle", written by Stephen King and Joe Hill, their first collaboration. I am thrilled and I can hardly wait the outcome. You can find this news and the press release on Mr. King's website. I found the trailer of "The Colour of Magic", a television adaptation of Terry Pratchett's "The Colour of Magic" and "The Light Fantastic" by Sky One. 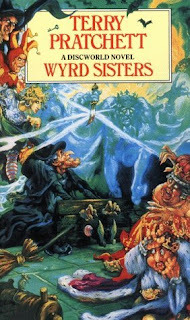 It was broadcast on Easter in UK, so it is an old news but I really enjoyed the trailer (you can see it here) and that made me curious about the interpretation of Rincewind, Twoflower, Luggage and Cohen the barbarian, and many other things. In the cast list I saw that Twoflower is played by Sean Astin, the former Samwise Gamgee, I saw Christopher Lee, and I love how he portrays villains, and I saw Jeremy Irons. I just hope that this movie will be realease on DVD too, because I would love to see it. And since yesterday I reviewed "The Darkness That Comes Before", today I found on FantasyBookSpot the first chapter of R. Scott Bakker's forthcoming novel "Neuropath" (you can read it here). Also I found a review of this novel on Pat's Fantasy Hotlist. Also I found the "Toll of Hounds" prologue on SFF World. I'm happy that I found only good news but worried a bit that my wishing list is a little larger now :). "The Darkness That Comes Before"
I have to admit that I have read some reviews before reading the novel and I have to say that those praises are deserved. Basically the novel is about a holy war, about a coalition of nations that try to recapture the holy city of Shimeh. But this I think is the bigger picture and the set for the next novels in the "Prince of Nothing" trilogy. 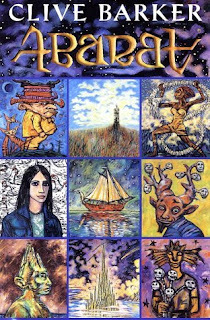 Mainly in this novel we follow the stories of the main characters, stories that lead us to the central plot. We have the story of Kellhus Anasurimbor, a northener in search of his father, after he hears his calls in dreams. There is Drusas Achamian, a Mandate sorcerer and a spy, sent by his school to find out information about Maithanet, a new spiritual leader that starts the Holy War. Another character is Cnaiur Urs Skiotha, a barbarian, chifteain of a Scylvendi clan, who is seeking revenge after a heavy defeat in battle. And he tries to revenge on a man that he thinks is responsible for his failure, Kellhus' father. We have the Emperor Ikurei Xerius that sees the opportunity to expand his empire through this Holy War, even though he despises and fears his nephew, Conphas, the general of his army. And also we find two female characters, Esmenet, a prostitute that follows Drusas, and Serwe, a concubine saved and used by Cnaiur and Kellhus. 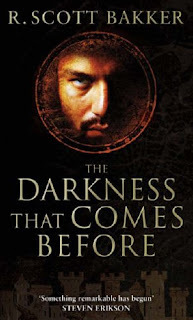 "The Darkness That Comes Before" starts slowly, R. Scott Bakker takes his time in introducing the characters and the plot, and this may seem a little bit boring. But the good things come for those who wait and after I advanced in reading I found the action very interesting. But this pace helps you discover the world created by the author, a world that I truly enjoyed. R. Scott Bakker creates a real and believable world, with history behind it, with conflicts and with interesting religion. And because of the author's attention for this details his world has a great depth. The characters are another strong point of this novel. The author doesn't limit his characters to the general definition of good or evil, he creates them with great talent, giving them strenghts and weaknesses, with well build background. I love the character Kellhus, he seems very selfish, doing things that are only in his interest and using people to achive them. But also he is capable of love, compassion and friendship. So it is hard to categorize Kellhus, but this is what makes him so fascinating and unique. Another character that I love is Cnaiur, a strong warrior, intelligent and with his actions dominated by force. He follows his clan brutal traditions, but is renegade by his people, and this contribues to his hate and desire of revenge. Drusas Achamian is the only character that tends toward one scale of the balance. He has the most human emotions, has inner conflicts and I see him as rather a good character, but I don't know what the outcome will be. The emperial figures look like true royalty, with selfishness, with materialism and with paranoid thoughts. The female characters are intriguing, guided by emotions. 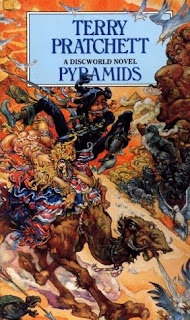 Overall I loved "The Darkness That Comes Before" by R. Scott Bakker, it reminds me of the greatest works of fantasy, and certainly is part of those great works. I will have to look quickly for the other two books of the serie because I think the best part is yet to come. 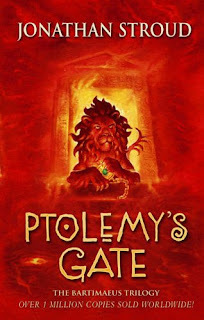 This novel is a "must have" for all fantasy lovers. For the second part of my presentation I want to tell you about my readings and my reviews. As I mentioned before my favourite genres are fantasy, Sci-Fi and horror. My most reading material comes from fantasy and it is followed by Sci-Fi and horror. Occasionally I read historical fiction and sometimes mystery. But my reviews will cover the favourite genres I mentioned. I read only one book at the time. I rarely start a second book without finishing the one that I read, mainly because I like to complete what I've started (even though sometimes is difficult). I'm not a very fast reader, I have a job that occupies most of my time. But every time I get the chance I read. I don't like e-books very much. I'm used to read books since childhood and so even it sounds conservative I love books. I love to turn the pages and I love to see the cover art whenever I open or close the book. And besides, at my work I spend 70% of my time in front of a computer. My reviews will have a description of the plot, but without spoilers. Also they will follow some general lines. Mainly it will follow the action, the worldbuilding and the characters, but not necessarily. The reason for this is found in my interest in geography, history and mythology, and I like to see what the authors create in their books regarding world, history and religion. My reviews are made by a reader for readers, so they will not fit the professional definition. As I mentioned in my first post I wanted to be an editor, but I end up studying economics (don't ask me how because I really do not know). Also you have to excuse my english because I've learned it myself (through books, movies and computer games) and I didn't learned it in school, so it is possible to encounter some mistakes in my reviews. I hope you will excuse them. Thank you for your visit and interest. Today I will post a quote that I enjoyed recently and I read it in the novel "Road of the Patriarch" by R.A. Salvatore. "The point of self-reflection is, foremost, to clarify and to find honesty. Self-reflection is the way to throw self-lies out and face the truth - however painful it might be to admit that you were wrong. We seek consistency in ourselves, and so when we are faced with inconsistency, we struggle to deny. Denial has no place in self-reflection, and so it is incumbent upon a person to admit his errors, to embrace them and move along in a more positive direction. We can fool ourselves for all sorts of reasons. Mostly for the sake of our ego, of course, but sometimes, I now understand, because we are afraid. For sometimes we are afraid to hope, because hope breeds expectations, and expectation can lead to disappointment." And this is one of the reasons why I love Drizzt Do'Urden. The way R.A. Salvatore writes Drizzt's thoughts is wonderful. 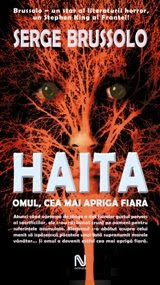 This review is a bit awkward because I've read this book in romanian and I don't think that had been published in english yet. The title means "The Pack" and as you can see from the cover arts, on the left is a french edition that you can find on Amazon.fr and on the right is the romanian edition published by Nemira publishing house. But I will post this review because it is the last book I've read. On the cover of my book Serge Brussolo is named Stephen King of France, and the statement isn't far from mark. The streets of Paris are haunted by a killer who is called by the press, The Skinner. The Skinner attacks only women, and his victims miss the scalp and the parts of the skin covered with hair. The Skinner is Georges Mareuil-Mondesco, a solitary figure, the only successor of a high society family. Georges is helped by an young lady with an unfortunate past, Sarah. But what is behind this criminal mind, what are the feelings that drive him? Why Georges refuses to visit the place where he keeps the "souvenirs" taken from his victims, the place found in his father's museum of stuffed animals? What is the link between all this and the stuffed animals? 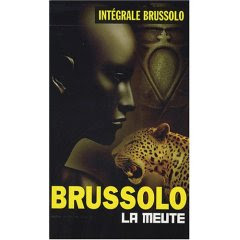 The novel of Serge Brussolo is very much like a play, the action takes part most of the time in the same set, Georges Mareuil-Mondesco's huge property. We have only two characters, Georges and Sarah, and the events are unfold in acts. The plot is original and it kept me interested until the novel's end. I enjoyed the characters of this novel. Serge Brussolo proves a very good knowledge of human psychology, creating his characters with excellent realism. Their thoughts, feelings and fears are described very well, confering depths to the characters. Georges, with a childhood lived in his father's shadow, is trying to live up his expectations, but failing almost every time. Isolated, considered freak by the other children, he developes phobies that will affect all his life. Sarah, an young girl raised in an orphanage, with a tumultuous history, becomes Georges' assistant through a more or less unfortunate circumstances. She will be forced to confront her past as well as her present. The novel's action is hallucinating, terrifying, at the limit of reality with imagination. The author is very careful with the details, the scenes being described with attention. The violent scenes are combined with scenes of an excessive sexuality and that creates grotesque images with great impact on novel's atmosphere. And if I mentioned the name of the Stephen King of France, I have to say that this novel reminded me of King's "Gerald's Game" and Dean Koontz's "Intensity". Same great characters, same thrilling action and the same unexpected finish. I liked "La Meute" of Serge Brussolo. Because of the author's efforts and the attention in characters' psychology, it was easy to get attached to them and to follow the action. In time I'm sure that I will read once again this novel. I will definitely recommend this novel. In this first post I want to introduce myself and tell you what I want with this blog. My name is Mihai and I'm a pationate reader. I discovered reading at the age of 6 and since the I read a lot. I read all sort of books, of all genres but I enjoy the most fantasy, Sci-Fi and horror and my reading is heavily concentrated in fantasy literature. Why this genres? Because they help me escape in new worlds, better or worst than this one, and because they allow my imagination to go free. So, because of my love for books, I dreamed of becoming a publisher (more than an author), but my life took a different course. Despite of this I have never gave up my readings (either my dream). I also love reviewing the books I read. I do this because it helps me to keep track of my readings, so in time I can remember what a book is about and to share my opinions with other readers of the same book. When I was younger I had been doing a different thing. I had created a soccer championship (soccer is one of my weaknesses). And in that championship the teams were named after the places in my readings and the players were the characters of those books. Until one point it was a very entertaining occupation, but after going to university, I renounced at my championship, mainly because of lack of time. And the reviews replaced my imaginitive soccer championship. And why this blog? Let me tell you my reasons. First because I enjoy reading, and I enjoy talking about it and sharing the thoughts about the books I read. Second because I like writing reviews and even than it's not the same with the real writing it gives me a sense of fulfilment. And I have to thank all the authors because without them and their works what will be the point of this blog. For the third reason I have to quote John DeNardo from sfsignal.com: "I would be lying to myself if I did not admit that there is some small chunk of vanity associated with "publishing" my very own words and having others read what I write." So even though I like writing reviews I also like my work to be read. And the last, but not the least maybe it will be some free books involved. This doesn't sound like love for books, but it is. I buy many books, actually I buy faster then I read, I love to see them in my library, I love to classify them, so if some free books will be involved I don't mind. And maybe I will discover a new rising star in fantasy literature. In the end I have to thank my wife for encouragement, and to Robert Thompson and Chris Hyland for advise and inspiration. I hope you'll enjoy reading my blog as much as I will enjoy doing it.